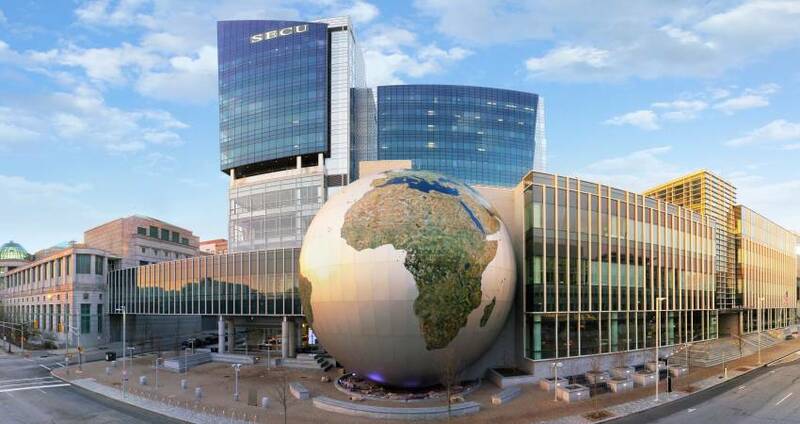 North Carolina Museum of Natural Sciences in downtown Raleigh isn&apos;t just a world-class (and free-to-visit!) museum. It&apos;s also a one-of-a-kind unique meeting venue, capable of hosting events for up to 2,300 attendees. Imagine dancing with dinosaurs, mingling amid live animals and meeting among whales-that&apos;s the reality at the Southeast&apos;s largest natural history museum! Meetings, corporate parties, wedding receptions and other special-occasion events are a perfect fit inside any of the gorgeous spaces available, ranging from board rooms to multiple floors and exhibit areas making up almost an entire wing of the museum. Get an inside look in this video with museum director Dr. Emlyn Koster, Ph.D.
Also of terrific note: the museum&apos;s excellent services focusing on providing accessibility for all, including the use of some great technologies. Wheelchairs and assistive listening devices are available onsite, and tactile kits can be provided for visitors with vision loss (guided tactile tours can also be arranged for groups at no cost). In addition, there is a free NC NatSci museum app available for iOS devices (devices are available to be borrowed from the museum store), which provides a multimedia guide of museum exhibits to help visitors with vision or hearing loss or learning disabilities experience an enhanced museum visit. Other services from the museum, such as naturalist center programs and outreach programs, can be tailored to meet the needs of learners of all ages, styles and needs.